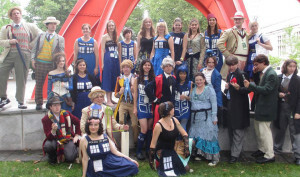 The Boston Whovians is a fan-run group for people of all ages in and around the Boston area who love Doctor Who. 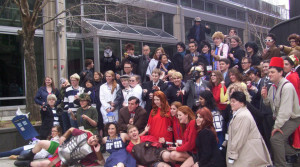 Originally founded in 2011 as a way for Whovians who attended meetups at Anime Boston to find each other, it has now grown into a community with over 1700 members. We occasionally hold meetups in the city, and host panels and photoshoots at conventions around New England including ConnectiCon, Arisia, and Boston Comic Con. Recently, we have been hosting free Doctor Who watch parties for the first and last episodes of the season, as well as planning for a convention of our own; Boston BritCon! We strive to be a welcoming and inclusive environment for all fans, regardless of age, number of episodes watched, or any other factor. As such, we will never ask for “dues” or charge money to be a member. Any money we collect through donations or cover charges is funneled directly back into planning bigger and better events for the group. To be a member of the Boston Whovians, all you have to do is say hello! Attend a meetup, join in the discussion on our Facebook group, like our Facebook page, follow us on Twitter, hang out with us at a con…and most importantly, allons-y! Copyright © 2019 The Boston Whovians. Powered by WordPress. Theme: Accelerate by ThemeGrill.